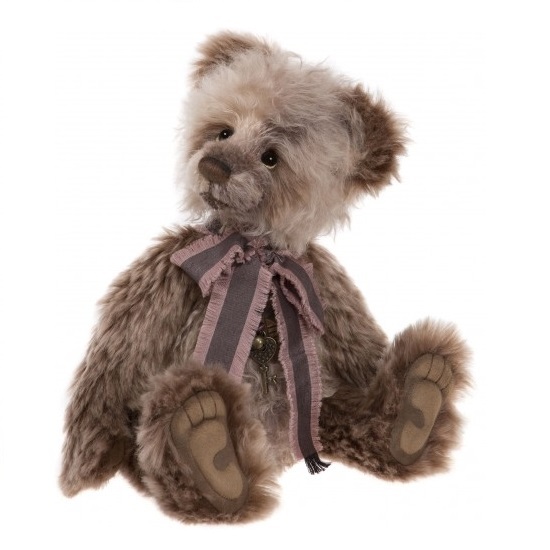 Davies from the Isabelle Collection of Charlie Bears is made of soft, pale tipped brown mohair, with a brown tipped, cream mohair tummy and face. He has airbrushed detail around his black eyes and brown stitched nose, and has light brown, ultrasuede, stitch-sculpted paw pads. Davies wears a frayed edge purple silk ribbon bow and a lace pendant with a key, wooden beads, button and bell attached.